On this Spectacular Switzerland tour, you'll enjoy Switzerland's stunning mountains and lakes—with overnights in Zurich, Geneva, the Gruyères area, the Interlaken area, and Lucerne. 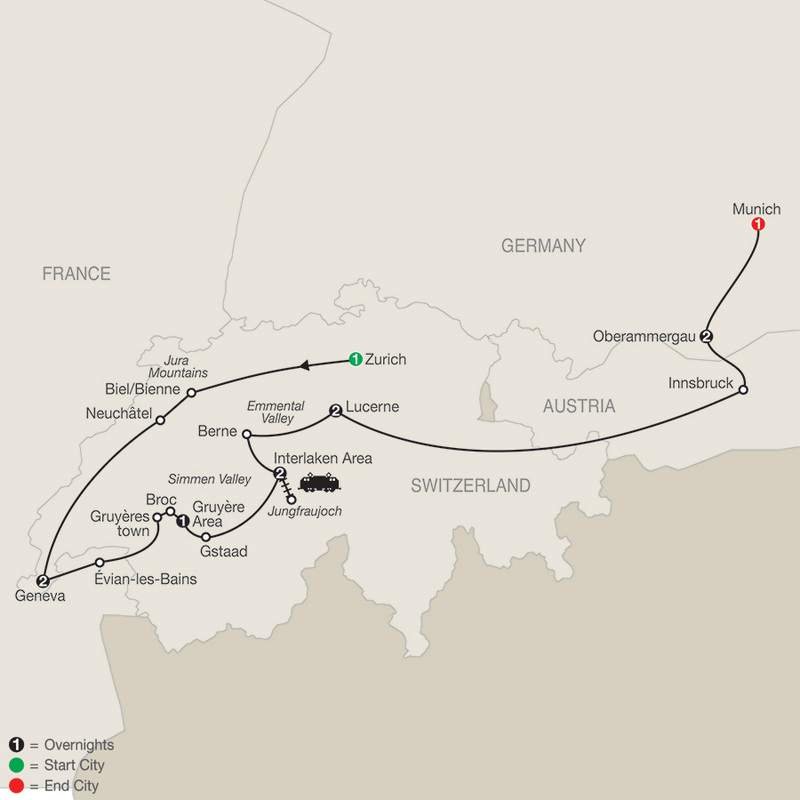 Plus, you 'll overnight in Oberammergau and Munich in Germany. The highlight of this tour is the time spent in the Interlaken area. The town is nestled between Lake Thun and Lake Brienz and is surrounded by three mighty mountains: Eiger, Mönch, and Jungfrau. From Interlaken, Globus has arranged an unforgettable rack railway trip to the "Top of Europe," a high alpine wonderland of ice and snow. Here, at the amazing Jungfraujoch, Europe's highest railway station at 11,332 feet, you can experience an audiovisual journey through the alpine world; stand on the observation platform to view the glaciers and witness a panoramic view overlooking France, Germany, and Italy; and more. It's an unforgettable experience! Another special experience that Globus has arranged is a visit to the magnificent castle in Gruyères, where you 'll walk through eight centuries of architecture, history, and culture. You'll also enjoy lunch with local specialties and a traditional dessert with meringue and double-crème at the castle. In Broc, sample delicious Swiss chocolate at a local chocolate factory. You'll also spend time in Berne, Switzerland 's capital, and Geneva, Switzerland's most international city, which has a fantastic lakeside setting and breathtaking panoramas of the Alps. In Lucerne, enjoy a guided walking tour that includes Chapel Bridge, a picturesque wooden bridge with the iconic water tower. See the iconic Golden Roof in Innsbruck, Austria, and Munich 's Marienplatz. In the charming village of Oberammergau, see the world-famous Passion Play, performed only once a decade by Oberammergau residents. 9LUCERNE-INNSBRUCK, AUSTRIA-OBERAMMERGAU, GERMANY. A comfortable drive brings you to Innsbruck in the Tyrolean mountains. Enjoy a walk through the Old Town to see the GOLDEN ROOF. Then, continue to picture-book Oberammergau. (B,D).